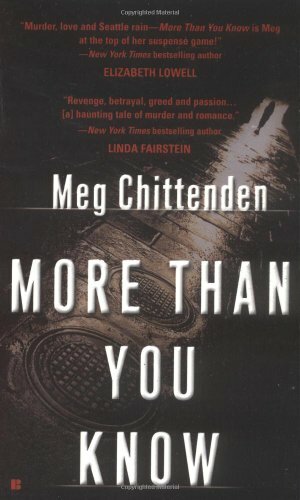 More Than You Know is a standalone suspense novel. The action starts out at the entrance to Pike Place Market in Seattle, one of my favorite places to be. The story began in my head when I was waiting there for my husband Jim to meet me and he was almost an hour late. Strangely enough, in the resulting story, Maddy Sloane is also waiting for her husband to pick her up at the entrance to Pike Place Market. (I have no imagination!) Unaware that FBI Special Agent Nick Ciacia is watching her from a short distance away, Maddy waits patiently at first, then begins to worry that perhaps Bart has been involved in an accident. She wouldn't wish that on him, even though their six month marriage is falling apart. While Maddy is trying to figure out what has happened to Bart, Nick Ciacia approaches her and offers his help. She doesn't recognize him, but he convinces her they've met and have mutual friends. It isn't long before she realizes that Nick Ciacia, attractive as he is, has a deadly agenda all his own.